Myrtle Beach is a beautiful vacation destination for people of all ages, full of sun, sand, and fun for the whole family. 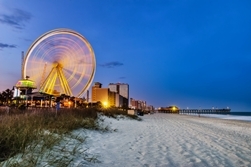 For many, a favorite part of any trip to Myrtle Beach is a visit to one of the many local amusement parks, full of things like games, junk food, and thrilling rides. Places such as The Pavilion Park, Family Kingdom, Wonderworks, and of course the SkyWheel promise a breathtaking good time for everyone. With the promise of a thrill, though, also comes a dash of danger. It’s time to get the facts about amusement park accidents so that you know what to do if your vacation takes a turn for the worst. Sadly, accidents at amusement parks are more common than anyone cares to talk about. A National Safety Council survey indicates that as many as 1,150 people were injured in 2014 at fixed-site amusement parks—which is actually an improvement over prior years. Other types of injuries that can happen in amusement parks include strokes, heart attacks, torn ligaments, lacerations, bruises and more. Operator error. Rides are complicated machines, and the competence of the employee or operator is often all that stands between a fun ride and people being hurt or killed. This is somewhat less common in fixed-location amusement parks with regular employees, versus a temporary or traveling amusement such as a fair or carnival. Poor maintenance. When the park and its employees fail to provide proper care and maintenance, safety features can fail and rides can break down dangerously, causing severe injury or death. It’s important for a park to maintain other parts of the park, too—a broken rail or walkway fallen into disrepair can cause serious harm. Badly built rides. Some rides are just defective from the get-go, the products of poor engineering and the rush to put out a new and exciting product before thorough safety testing has been completed. Personal security issues. Criminals know that the people visiting amusement parks are likely tourists carrying cash for food, tickets, and souvenirs. Crooks with bad intentions can prowl dark parking lots and dim corners, looking for easy prey, knowing that security personnel are often thin on the ground, poorly trained, and slow to respond. In North Carolina, the NC Department of Labor (NCDOL) Elevator and Amusement Device Bureau is generally responsible for safety inspections of amusement rides, though the Consumer Protection Safety Bureau also has the authority to inspect mobile amusements. The NCDOL requires permits for new ride installations, ride alterations, and performs periodic inspections throughout the year. Inspections for water parks are slightly different from regular “dry” amusement parks. While mechanical rides generally still must be inspected by the NCDOL, the quality of the water may not be. In 2016, an 18-year-old woman who had visited a water park in Charlotte died due to infection by N. fowleri, a deadly amoeba (a type of single-cell organism) that attacks the brain. Tests later confirmed that the infection came from a water park, and it was revealed that since the park was considered an “open body of water” it did not require the same water quality inspection process as a public swimming pool would. Water parks are generally safe, but it might be wise to wear nose plugs or avoid getting water in your nose and avoid submerging your head as much as possible. If you or someone you love has been hurt or even killed as a result of negligence by an amusement park or its employees, you may have legal options. A personal injury lawsuit can compensate you for negligence that resulted in personal injuries or even wrongful death. While money can’t take back an injury or a loss, it can help pay for medical bills, rehabilitation, lost wages, pain and suffering, and more. To talk to an experienced legal professional about your potential case and the compensation that you may be owed, call the Law Office of Kenneth E. Berger today at 843-800-0911. ?Who Is Legally Responsible for Injuries on Rental Properties in South Carolina? ?How Is Lost Income Calculated in a Personal Injury Case? ?How Much Should the Insurance Company Compensate Me for Scars Caused By an Accident in SC?